Sign reads “This is my work. I need it to sustain my grandkids.” (Photo credit: Manuel Rosaldo). When it comes to recycling policy, Porto Alegre is a city of firsts. In 1986, Porto Alegre became the first Brazilian city to legally recognize a waste picker organization. In 1990, it inaugurated the first public recycling route and warehouse in Brazil to include waste pickers, making Porto Alegre a world reference in inclusive recycling policies. 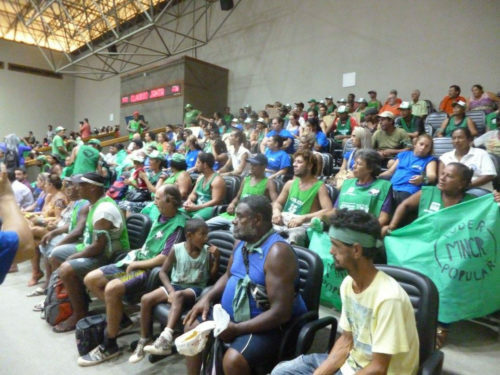 In recognition of its leadership, Porto Alegre was selected as the host city for the first meeting of the Latin American Waste Picker Network in 2005. And just last year, Porto Alegre became the first capital of a Brazilian state to ban incineration, a policy that protects both the environment and the livelihoods of waste pickers. 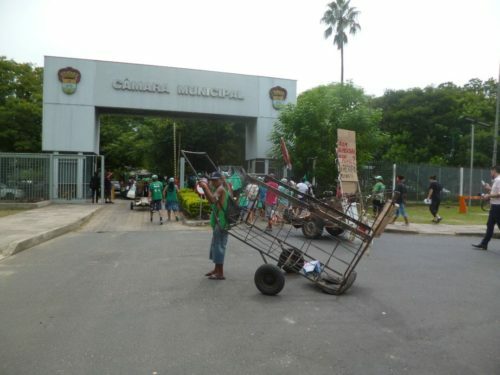 Last Friday, however, Porto Alegre earned a more ignominious distinction: it became the first Brazilian city to ban the use of pushcarts, effectively criminalizing the work of thousands of street waste pickers who rely on pushcarts to ply their trade. The law, which also bans another preferred tool of waste pickers, horse carts, was first approved in 2008, but not scheduled to take effect until 2016. In the interim, the city was to provide training and resources to help waste pickers transition into alternative professions. However, a 6-month delay was granted in the implementation of the law in recognition of the fact that the city never provided the promised resources. The ban threatens the survival over 7,000 vulnerable families who eke out a living from street waste picking, in the midst of record-breaking unemployment. This represents nothing less than a human rights crisis. It violates waste pickers’ right to work and threatens their right to food, clothing, and shelter, as stipulated in Articles 23 and 25 of the Universal Declaration of Human Rights and articles 4, 5, and 6 of the Brazilian Constitution. Notably, waste picking, including “the use of horse carts and push carts,” has been recognized as a legal profession in Brazil since 2002, as detailed in Code 5192-05 of the Brazilian Classification of Occupations. Sign reads “In defense of waste picker’s work. Code 5192-05 of the Brazilian Classification of Occupations.” (Photo Credit: Manuel Rosaldo). I am a sociologist from the University of Berkeley in California who has conducted extensive research on inclusive waste management policies in Brazil, Colombia, and the US. 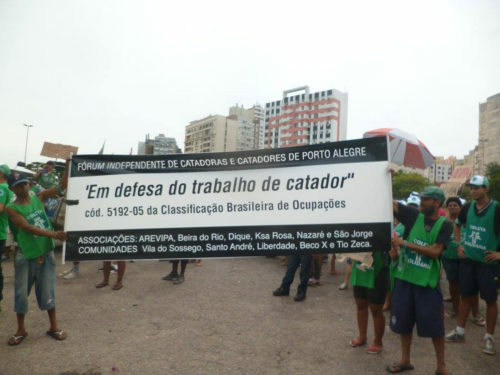 Last week, Brazil’s National Movement of Waste Pickers and Porto Alegre’s Independent Forum of Waste Pickers invited me to Porto Alegre to serve as an international human rights observer during the days before the new law took force. I visited five of Porto Alegre’s vilas (informal neighborhoods), where I gathered testimony from 25 street waste pickers, not one of whom had been included in the city’s programs to retrain them for alternative professions. On Thursday, March 9, I accompanied several hundred waste pickers as they marched to demand the right to continue in their profession and to be recognized and remunerated for their work. First, we marched to the City Council Building. To my surprise, City Council administrators, who had insisted to have no time to speak to us just hours before, received us warmly in a large auditorium. The 12 leaders of the Council, each of whom represented a different political party, addressed us one by one, expressing sympathy for the waste pickers’ cause and critiques of the cart ban. Then, we marched to the mayor’s office, where a surrogate of the mayor promised that the police would only use “educational” and not “punitive” measures against street waste pickers. Sign reads “Who Will Feed Our Children?” (Photo Credit: Manuel Rosaldo). Marching into the City Council Building. (Photo Credit: Manuel Rosaldo). Waste Pickers listen to City Council leaders, who express support for their cause. (Photo Credit: Manuel Rosaldo). 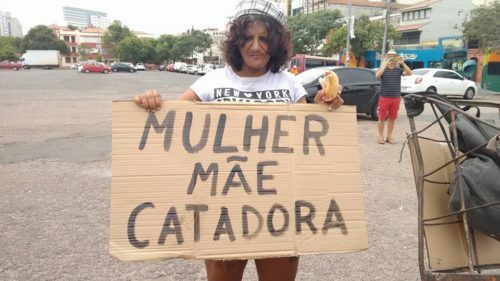 Sign reads “Woman, Mother, Waste Picker.” (Photo Credit: Ana Paula Rocha). Signs read “I Don’t Want to Rob,” “Working on the Street is Our Right,” “We Are Fighting for Our Survival.” (Photo Credit: Manuel Rosaldo). To be sure, the sympathy demonstrated by public officials was a positive development. 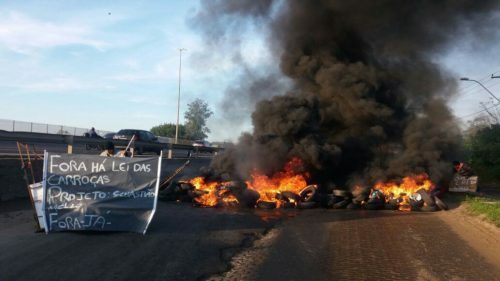 Nonetheless, the ban remains on the books, and despite the mayor’s promises, several street waste pickers claim to have been harassed by police in Porto Alegre last week. More troubling still, in the midst of a rightward lunge in Brazilian national politics, public authorities in several cities appear to be cracking down on street waste pickers. Policy makers in cities such as Belo Horizonte have proposed copycat laws to Porto Alegre’s pushcart ban. In São Paulo, in contrast, no law was passed against waste picker carts, but police nonetheless confiscated several waste picker carts in the city center on the week of March 20, 2017. 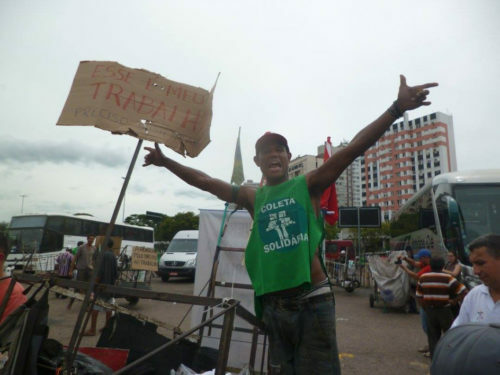 Also that week, city authorities served eviction notices based on alleged ground use violations to São Paulo’s two remaining street waste picker associations, where over 250 waste pickers store their carts and collectively sort and sell their materials. 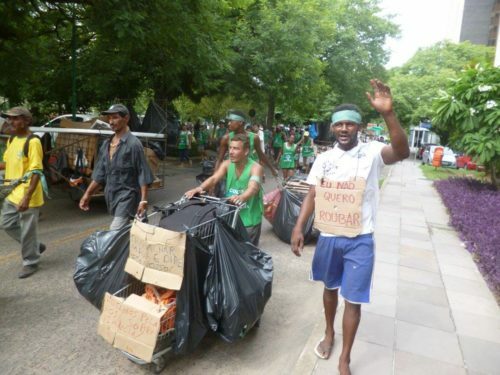 Organized waste pickers in Porto Alegre are seeking dialogue with authorities and support from communities. However, if public authorities do not repeal the law, the waste pickers are prepared to take more drastic measures such as blocking major city throughways. As one waste picker said, “if carts can’t circulate, neither will cars. If we can’t work, no one will.” Given the fact that similar protests broke out last July, this should not be taken as an idle threat. 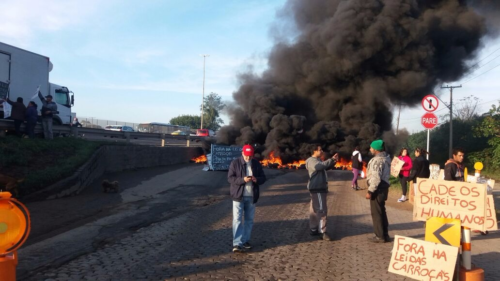 Waste pickers burn tires to blockade a freeway in Porto Alegre on July 29, 2016. Sign reads “Out with the Cart Ban. Out Already!” Photo Credit: Ana Paula da Silva Junkherr. Signs read “Where are our Human Rights?” “Out with the Cart Ban.” Photo Credit: Ana Paula da Silva Junkherr. Unfortunately, attempts to criminalize street waste pickers are commonplace throughout the world. Their results are predictable: they never succeed in wholly eliminating waste pickers, only in exacerbating their marginality, poverty, and persecution. Often, powerful economic interests lie behind such efforts, such as developers who seek to remove informal workers from urban landscapes in order to increase property values, or private waste companies who want to monopolize the wealth that can be extracted from the city’s waste. But also, many people may support the laws due to honest misunderstandings about waste pickers and their role in society. Below, I challenge some of the most common such myths, and highlight policies that could improve recycling rates and the livelihoods of waste pickers. This list is inspired by a similar list that appeared in the book The Wolrd’s Scavengers: Salvaging for Sustainable Consumption and Production (2007) by Martin Medina. 1.) Street waste pickers provide little benefit to society. Street waste pickers collect nearly 90% of the material that is recycled in Brazil, and have helped Brazil achieve a world-record 98.2% recovery rate for cans. With proper support, they could achieve similar rates for other materials. Waste pickers’ work provides considerable economic and ecological benefits: reducing waste transportation costs, saving room in landfills, cutting the quantity of virgin materials needed for production, and mitigating climate change. 2.) “Modern” cities do not have street waste pickers. Waste pickers work in virtually every major city in the world, including those of the Global North. Indeed, 21 countries across North America Europe, and Asia even incentivize informal recycling through “bottle bills.” These countries levy small taxes on bottles and cans, which are used to pay waste pickers or consumers for returning the materials to official recycling centers. My home city, San Francisco, California, possesses among the most advanced recycling technologies, regulations, and public education programs in the world. Thanks to the bottle bill, it also has thousands of waste pickers, though they are rarely recognized for their contributions. 3.) Waste pickers are not efficient. In an article titled “The Efficiency of Informality,” Environmental Scientist Sintana Vanegas and colleagues compared the reduction of greenhouse gases generated by street waste pickers in Bogota, Colombia to hypothetical reductions generated by private recycling companies. They found that street waste pickers far outperformed private companies due primarily to the fact that they not only recycle, but they also salvage many items from waste to reuse or sell. 4.) Street waste pickers cause traffic: Traffic is caused by poor urban planning and insufficient public transportation, not by waste pickers, who have as much of a right to the road as anyone else. One way to relieve congestion, however, is by expanding bike lanes, which not only incentivize people to bike, but also are utilized by waste pickers and street vendors. 5.) Waste pickers abuse animals: Though the scale of animal suffering inflicted by waste pickers’ horse carts is a pittance compared to other industries such as factory farming, it cannot be denied that waste pickers sometimes do not properly care for their horses—often due to insufficient incomes. The solution is either to provide waste pickers with the resources to care for their horses, or to provide them with alternative means of transportation. For example, Bogota prohibited the use of horse carts in 2012, but gave nearly 3,000 pickup trucks to the waste pickers who relied on the carts to make a living. 6.) Waste pickers are delinquents and criminals: Quite to the contrary, several studies have shown that recycling helps very poor people avoid turning to crime. For example, economist Bevin Ashenmiller tracked crime rates in 10,000 North American cities from 1973-2001. She found that rates of petty larceny went down when cities began to implement “bottle bills” that incentivized informal recycling. 7.) Waste picker cooperatives have resolved the “problem” of street recycling. 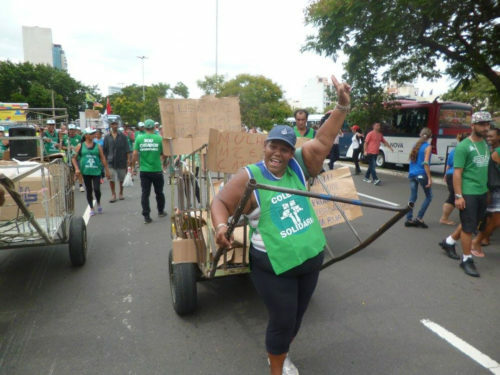 Currently, Porto Alegre’s 17 waste picker cooperatives employ some 600 waste pickers, who focus primarily on sorting materials collected by the official recycling route. The cooperatives are a wonderful initiative, but do not currently have the capacity to absorb the city’s 7,000 street waste pickers. Moreover, the cooperatives are badly underfunded, and as a result, often pay far below the minimum wage. If the city were to increase support to cooperatives, and contract them to provide services such as recycling collecting and environmental education, they would become a more attractive alternative for street waste pickers. 8.) Street waste picking is just about the worse profession that exists. Many of the waste pickers whom I interviewed in Porto Alegre and other cities report earning over one minimum wage. Many had worked in low-income formal jobs previously, but preferred recycling where they experienced increased earnings, job security, flexibility, and workplace freedom. 9.) It is not possible to improve the work standards of waste pickers who work on the street. Many cities have found ways to recognize and remunerate the work of street waste pickers. For example, in Bogotá, Colombia, city officials identified 18,000 street waste pickers through a census process and distributed city uniforms to them in recognition of their public service. Also, Bogotá makes bimonthly payments to 13,000 waste pickers based on the quantity of materials they sell to registered scrap dealers. The city pays waste pickers via text messages with codes that are redeemable at ATMs. 10.) Waste picking is a source of vulnerability. Informal recycling is a resource that vulnerable populations created over several generations, a feat of great ingenuity. The sources of waste pickers’ vulnerability are broader structures of class, gender, and race-based oppression, as well as state ineptitude, exclusion, and persecution. The solution is more just social policy, not criminalization. Thank you fot busting those ten myths, Manuel. The photos are powerful. What can we learn from Columbian waste pickers? How was their better situation in Bogata won?